View all products by Living Clay Co. Living Clay Co. Fresh Mint Bar Soap is made using only the finest organic olive, coconut and palm oils, herbs, pure essential oils, sea salt, and Calcium Bentonite Clay. 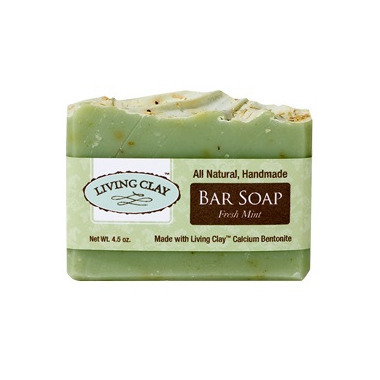 Living Clay Co. Fresh Mint Bar Soap retains its glycerin, which is a naturally occurring reaction in the making of soap. Commercial soap companies typically remove natural glycerin and add less "skin friendly" chemicals to their process. The clay in Living Clay Co. Fresh Mint Bar Soap helps to deep cleanse and exfoliate your skin, leaving it feeling smoother, cleaner, and looking more vibrant. For use on face, body and hair.